New Gourna is situated in a strategic location west of the Nile between the Luxor and the Valley of the Kings. The village, designed by Hassan Fathy in the 40s, had to accommodate the families who lived in Old Gourna, located too close to the ancient Egyptian monuments. 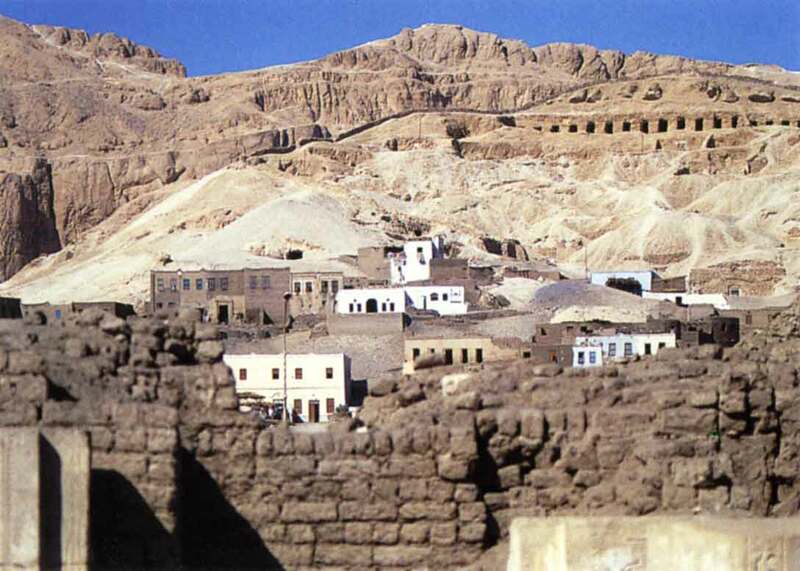 The village is situated on the axis that connects Luxor to the Valley and is structured around another axis that is perpendicular to the mosque. 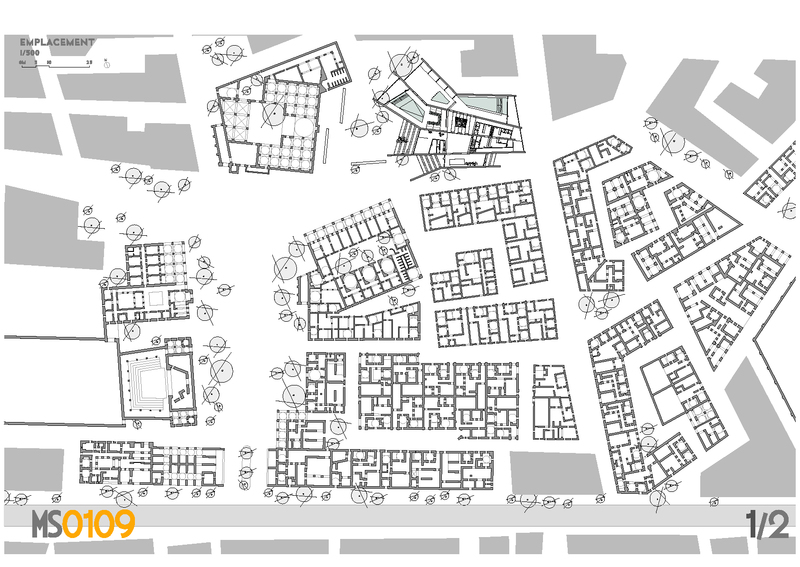 Around the mosque is organized a series of enclosed public spaces for homes and public buildings such as the theater or the school with a poorly defined structure. 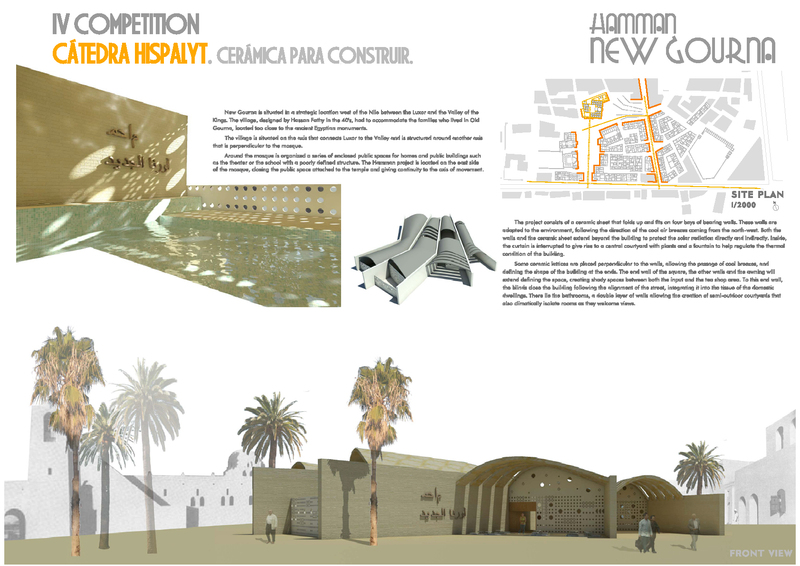 Our project is located on the east side of the mosque, closing the public space attached to the temple and giving continuity to the axis of movement. "It is important to understand that this local search for forms and their incorporation in the new village proper was not for a sentimental desire to keep some souvenir of the old village. It was always the purpose to restore to this to the Gournis, their local heritage- vigorous building inspired tradition, involving the informed cooperation of active clients and skilled craftsmen. " Hassan Fathy, Architecture for the Poor: An Experiment in Rural Egypt. 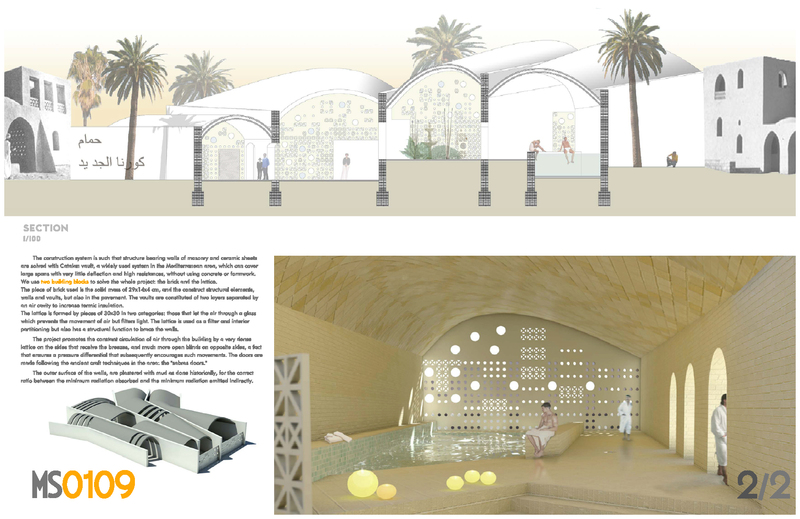 Our project consists of a ceramic sheet that folds up and fits on four bays of bearing walls. These walls are adapted to the environment, following the direction of the cool air breezes coming from the north-west. 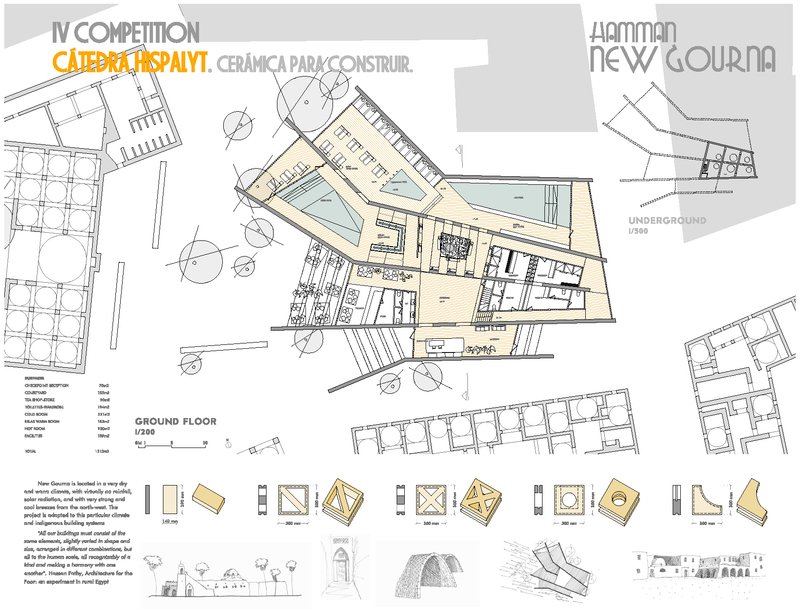 Both the walls and the ceramic sheet extend beyond the building to protect the solar radiation directly and indirectly. Inside, the curtain is interrupted to give rise to a central courtyard with plants and a fountain to help regulate the thermal condition of the building. The ceramic lattices are placed perpendicular to the walls, allowing the passage of cool breezes, and defining the shape of the building at the ends. The end wall of the square, the other walls and the awning will extend defining the space, creating shady spaces between both the input and the bar area. To this end wall, the blinds close the building following the alignment of the street, integrating it into the tissue of the domestic dwellings. There lie the bathrooms, a double layer of walls allowing the creation of semi-outdoor courtyards that also climatically isolate rooms as they welcome views. New Gourna is located in a very dry and warm climate, with virtually no rainfall, solar radiation, and with very strong and cool breezes from the north-west. Our project is adapted to this particular climate and indigenous building systems. "All our buildings must consist of the same elements, slightly varied in shape and size, arranged in different combinations, but all to the human scale, all recognizably of a kind and making a harmony with one another". 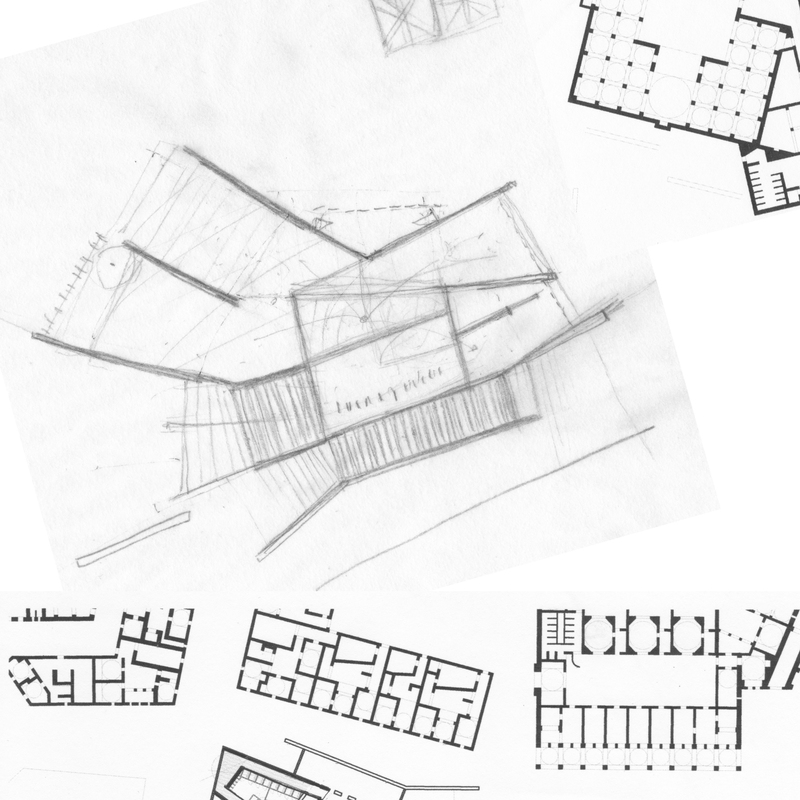 Hassan Fathy, Architecture for the Poor: an experiment in rural Egypt. The construction system is such that structure bearing walls of masonry and ceramic sheets are solved with "volta Catalana", a widely used system in the Mediterranean area, which can cover large spans with very little deflection and high resistances, without using concrete or formwork. 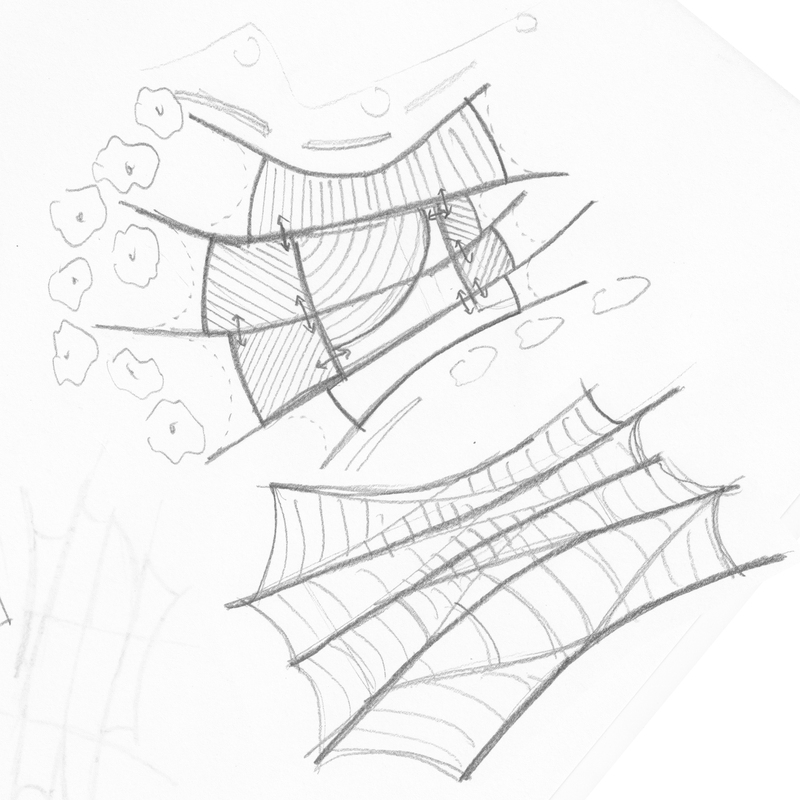 We use two building blocks to solve the whole project: the brick and the lattice. The piece of brick used is the solid mass of 29x14x4 cm, and the construct structural elements, walls and corners, but also in the pavement. The corners are constituted of two layers separated by an air cavity. The lattice is formed by pieces of 30x30 in two categories: those that let the air through a glass which prevents the movement of air but filters light. The lattice is used as a filter and interior partitioning but also has a structural function to brace the walls. The project promotes the constant circulation of air through the building by a very dense lattice on the sides that receive the breezes, and much more open blinds on opposite sides, a fact that ensures a pressure differential that subsequently encourages such movements. The doors are made following the ancient craft techniques in the area: the "sabras doors." The outer surface of the walls, are plastered with mud as done historically, for the correct ratio between the minimum radiation absorbed and the minimum radiation emitted indirectly.